Isolde is a Redguard pirate serving aboard The Serpent's Wake, which is currently docked in Anvil for refitting. Like most of the crew, she's staying at The Fo'c's'le. Unlike them, however, she is also a Sleeper Agent for the Mythic Dawn cult, and will attack you on sight after you finish the Dagon Shrine quest. Isolde wakes up in her room every day at 9am and starts her daily routine, where she will pay random visits to either The Flowing Bowl or the dining area in the Fo'c's'le's and will continue to do so until 3pm. At that time, she will probably stroll around the dockside, preferably near the Anvil Dock Gate, while occasionally visiting the Flowing Bowl. At 6pm, she will go back to her usual routine and keep it up until her bedtime at 11pm. She's armed with an iron shortsword and wears a collared shirt with laced leather pants. 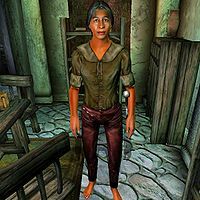 She carries around a clue to her real identity, the conjuration skill book Mythic Dawn Commentaries 1, as well as the key to The Fo'c's'le and a small amount of gold. She is as impolite as any of the pirates on the dockside, and when you approach her she will just say: "I'm Isolde, mate... not that it's any of your business. ", and if you ask her about Anvil you will get the following insult: "Why don't you just walk around and look for yourself? You need someone to explain everything to you?" She does have one or two things to say about Thurindil: "Crazy as a rat in a catbox. Just leave him alone. He's not hurting anybody." As a member of the Mythic Dawn, she possesses the standard spell to summon a bound mace along with Mythic Dawn Armor and Helm. As with almost all Mythic Dawn agents, if Isolde is not dead by the time you finish Light the Dragonfires, she will no longer be hostile towards you.